Tirupati Steel Enterprises was founded by Shri S. D. Garg in the year 1993 on a small scale and since then the company has grown into a leading trader of steel in Chhattisgarh and M.P. states of India. The company is now also getting the support and management from his son Mr. Abhishek Garg. Tirupati Steel Enterprises is the authorized dealer and M.O.U. 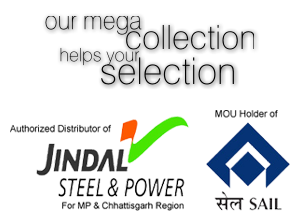 holder of SAIL (Steel Authority of India Limited) and authorize distributor of JINDAL STEEL POWER (JSPL) for Plates, Sheets, Structural Steel etc. According to the audited figures, Turnover of the company is currently Rs 150 crore annually and going on higher figures. We have the ability to source any type of steel for any purpose. We handle all orders of individual or bulk structural steel requests and our full line of products and services includes: Steel all shapes and sizes like Channels, Angles, Beams, Plates and Sheets etc. We have been able to succeed as one of the most trusted and dependable steel suppliers. We keep our prices affordable so that our customers will always receive the highest value per order. We have facility of excise gate pass which is added advantage for our customers who want to avail CENVAT credit.